You are currently browsing the The Accidental Hawaiian Crooner blog archives for April, 2013. 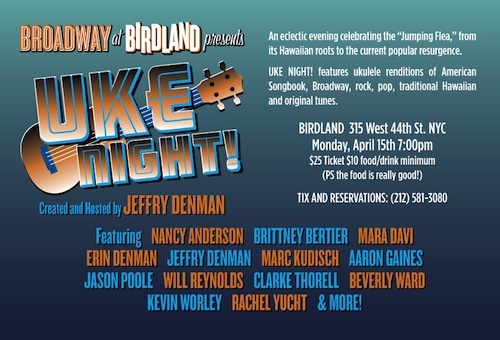 I’m so excited to be a part of this AWESOME EVENING OF ‘UKULELE MUSIC here in NYC on Monday, April 15th!! Yup. This one is gonna be GOOD! Lots of Broadway stars. Lots of singing. Lots of strumming. And all of it the legendary venue, BIRDLAND. Here’s what they’re saying about it on Facebook: UKE NIGHT! at Birdland on Monday April 15th. Proceeds to be donated to the Barden Family Fund, helping the family of young Daniel Barden who was a victim of the Sandy Hook/Newtown tragedy. Come on out, hear some fine uke-playing on some songs you might not expect and help donate to a very worthy cause. And please click HERE to access a link to Birdland’s website. So if you’re going to be in the NYC area, I’d LOVE to see you there! Great music for a very worthy cause. $25 ticket plus $10 food/drink minimum. On April 1, 1946 at approximately 7:15 AM (HST) a tidal wave struck the Hawaiian islands. 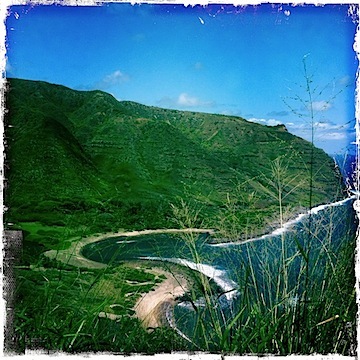 And in its destructive path was the village of Hālawa on the island of Molokai. My kumu (teacher)/hānai Pops was only six years old when it happened. A child who watched the wall of water reach 1.6 miles into valley he calls home and wreaked havoc on all that it touched. This afternoon, I was working on the computer in my apartment in NYC–a zillion miles away from the quiet of Hālawa Valley–when the phone rang. It was Pops, calling from his cell phone up near Pu’u O Hōkū Ranch where the cell phones sometimes catch service. Our conversation started out friendly as always and then he grew quiet. Pops tells the story of the tsunami often. Sometimes to the people of Molokai when he offers a talk-story/cultural presentation. But most often, he shares the story with the visitors he receives in Hālawa Valley–folks coming for the hike to the waterfalls or to learn about the valley and its rich history. I’ve heard it so many times. And yet every time I hear it, I get chickenskin. Goosebumps. He tells the story best. And to REALLY hear it, you should hear it from him. Live and in person. The story begins on March 31, 1946. Back in those days, Hālawa Valley had a telephone–kind of like a “party line” where every family had their own ring. 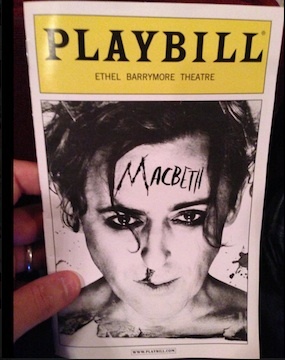 At at about 8:00 PM, the phone rang. It was the police informing them that a tsunami would be hitting the Hawaiian islands the following morning. He says that Tūtū Kāne (Grandpa) led the family in prayer, asking for guidance through whatever was about to happen. The younger children went back to sleep and the older folks stayed awake. And when they were on the beach, they were horrified to see that ocean had receded a huge distance. He could hear them scream as they raced back into the valley. ”KAI EʻE! KAI EʻE! KAI EʻE!” Tidal wave! Tidal wave! Tidal wave! Someone had run to the church in the valley and rang the bell frantically to signal an emergency. Tears usually fill Pops’ eyes as he talks about watching the wave reach the valley. ”It’s not the kind of wave you can surf. It was a wall of water that came in and and went all the way through here,” he says with a sweep of his hand that seems to cover the entire valley, from the ocean to the mountain. He talks about watching a family jump from their home as it was being sucked out into the ocean by the receding waters. He also makes sure he points out that while the tidal wave had severely damaged the valley and its plentiful loʻi (taro patches)–it did not destroy them. The loʻi had, indeed, been filled with sand. But the people were able to dig out the sand and flush the taro terraces with fresh water. Another historical inaccuracy is that folks were forced to leave the valley after the tsunami. But that, too, is false. According to Pops, many folks had already left when Word War II began. As the oldest living descendant still residing in the valley, Pops feels it’s important to share the story of what happened the day the tidal wave struck. “It’s important to keep the memory alive,” he reminds me. And I will, Pops. I promise.